A very elegant birdnest cultivar of S. trifasciata that is perfect as a potted houseplant or grown outdoors as groundcover. Such a petite plant with exquisite variegation on their leaves and arranged in symmetrical rosette that is absolutely captivating! We started off with a single plant in our garden bed in mid 2005 as seen in this image and it has multiplied steadily and generously ever since. 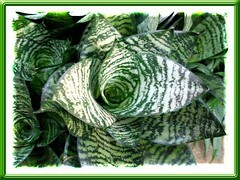 Common Name: Silver Birdnest Sansevieria, Silver Bird’s Nest Snake Plant, Dwarf Silver Snake Plant. Plant type: Indoor or outdoor ornamental succulent plant, originated in New Orleans, United States and was patented (Plant Patent No. 1220) in 1953 by Sylvan Hahn. Light: Filtered to full sun or partial to full shade. Not particular to light levels. Propagation: By crown division and leaf cuttings. Propagation by division will produce plants similar as parent plants whereas will usually not propagate true to type via leaf cuttings. Propagation by leaf cutting is easily done by cutting an entire leaf and push it with the basal end down into well-drained loosened soil. 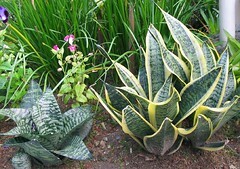 Features: Sansevieria trifasciata ‘Silver Hahnii’ is an evergreen herbaceous perennial succulent, originated as a sport of the cultivar ‘Hahnii’. Thus, it is another of the birdnest cultivars of the trifasciata species, with a small cluster of short leaves that are broad and reflexed, plus beautifully arranged in a vase-shaped rosette, resembling a bird’s nest, hence the name. The glossy and smooth-textured leaves of ‘Silver Hahnii’ are striking and fabulously variegated – silver and gray-green in color, and suffused with indistinct and irregular green bands that run horizontally across the leaves, together with thin dark green margins. Compact and dwarf in stature, more petite than the ‘Golden Hahnii’, this upright plant grows slowly to attain a height of about 6-8 inches with a similar spread, forming clumps as it sends out suckers freely from its rhizomes. Birdnest cultivars of S. trifasciata are not known to flower? 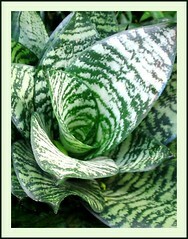 Usage: Being tolerant of low light and dryness, Silver Birdnest Sansevieria will be excellent as a potted houseplant. It is popularly grown indoors, not only for its attractiveness and durability but also for cleansing the air in the home of benzene and formaldehyde. Ideal for outdoors too in mixed planters with other drought tolerant plants, and as groundcovers in garden beds and borders. Most suited for xeriscaping and rock gardens. Care: S. trifasciata ‘Silver Hahnii’ is another easy-care plant, almost thrives on neglect. Just know that it absolutely dislikes soaked feet, but loves the sun and warmth. So, plant it in well-drained loam-based soil and be very careful never to overwater, otherwise it’ll succumb to rot. Though a sturdy survivor in a wide range of light conditions, it performs best in good light or sunny locations. Exposure to prolonged low-light conditions will result in leaves that are featureless, lacking in good shape and coloration. Feeding is optional, but if you’d like to, fertilize with a soluble fertilizer at half the recommended strength sparingly during the growing season. Though this dwarf cultivar loves to be potbound, do thin overcrowded clumps and replant elsewhere, as overcrowding will restrict and distort new rosettes. It’s hardly bothered by pest or diseases. For temperate regions: Hardiness: USDA Zone 9a-11. Avoid cold and wetness, but provide good light and warmth. Well-drained soil is essential. Water moderately in summer, but keep it dry during the winter. 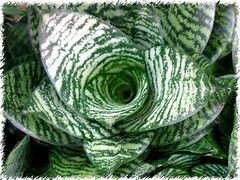 To know more about sansevieria’s culture, refer to fact sheet by International Sansevieria Society. I live in the uk do you think this plant would do well planted outdoors ? We think that it’s okay to plant this beauty outdoors provided it gets enough sunshine and warmth.